Being in a pickle was never this delicious. Like us, if achaar is bae for you too and you haven’t tasted the delectable pickles by Little Farm Co., you’re clearly missing out. We can’t let that happen, can we? So we’ve teamed up with Little Farm to bring to you some of their best-selling pickle combos, straight to your doorstep. The best part – these yummy pickles can be paired with anything from matthis and rotis to chips and all kind of munchies. The Little Farm Co. handcrafts farm fresh pickles that are rich in taste, farm-fresh and delicious. Since these pickles are also handcrafted, the pickles are preservative and additive free. To start off, we’ve giving you their Classic Best-Selling Chilli Combo of 4 of our favourite pickles by them-green chilli , red chilli , jalapeño and green chilli gur. Little Farm’s Adrak green chilli pickle is a definite must have in all Indian kitchens – the conventional Jalapeño Pickle is redefined with a combination of jalapeños, fresh gingers and choicest spices to give you a unique flavour! 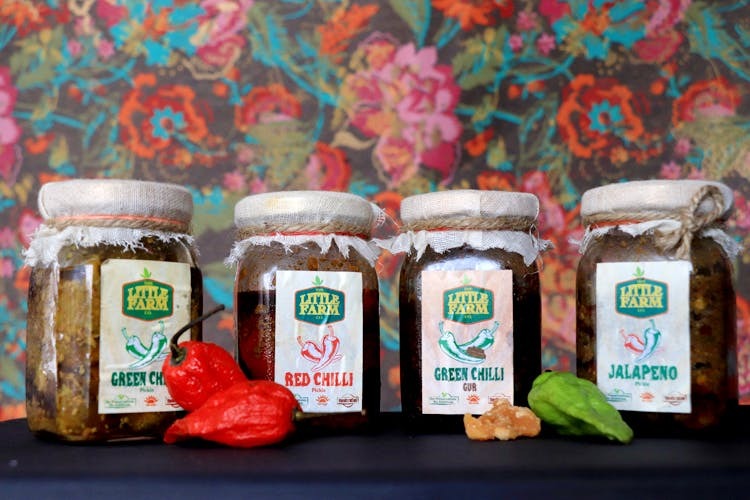 The Little Farm Co.’s Green chilli gur pickle will bring this infamous combination of chilli and jaggery back to life and fame. With the perfect combination of the spicy flavour of green chilli and just the right amount of sweetness of their freshly prepared jaggery, you won’t be able to have just one! Our all time favourite classic Masala Stuffed Red Chillies are pickled to perfection under the sun. Grab Your LBB Special Combo Now! We’re offering you their Classic, Bestseller Chilli Combo which includes a delicious jar of green chilli , red chilli , jalapeño and green chilli gur Pickle.